By Ida Jessie Sagina, Scrapeworks. If there’s anything that I’ve learned in content creation over the past year, it’s that no matter how good your piece of content is, without strategic promotion and marketing it isn’t going to add the intended value to anyone, be it the readers or the company I work for. Though promoting on social media and company website counts, if my blog or whitepaper reaches a highly-qualified list of readers who’ll find the content truly useful then you couldn’t find a more gratified writer than me! So how am I going to build that golden list for every content I develop? The Web is a huge mine of thoughts and interests expressed by diverse people and collecting data from this wealth of information could help me spot the right audience - a process familiarly known as web scraping. Well, I could outsource the entire scraping job to a managed services company but my coding and tools-exploration instincts cultivated during my 3 year-stint as a cyber techie in a leading software development company, got the better of me. I decided to get my hands dirty with the ins and outs of web scraping and the number of options I had knocked me out. Armed with my study of the web scraping landscape, I’ve categorized all the available options I was able to find and the unique features of popular web scraping tools found in the market that appeals to different audience segments. Before jumping straight to the web scraping tools, it’s important to determine how you are going to harvest web data and that’s dependent on the purpose, your levels of curiosity and the resources you have in hand. This is for code-savvy folks who love experimenting with site layouts and tackle blockage problems and are well-versed in any programming language like Python, R or Perl. Just like their routine programming for any data science project, a student or researcher can easily build their scraping solution with open-source frameworks like Python-based Scrapy or the rvest package, RCrawler in R.
Web scraping tools suitable for developers mostly, where they can construct custom scraping agents with programming logic in a visual manner. You can equate these tools to the Eclipse IDE for Java EE applications. Provisions to rotate IPs, host agents, and parse data are available in this range for personalization. To the self-confessed non-techie with no coding knowledge, there’s a bunch of visually appealing point and click tools that help you build sales list or populate product information for your catalog with zero manual scripting. For enterprises that look for extensively scaled scraping or time-pressed projects where you don’t have a team of developers to put together a scraping solution, web scraping services come to the rescue. If you are going with the tools, then here are the advantages and drawbacks of popular web scraping tools that fall in the 2nd and 3rd category. Truly a killer in the DIY tools category, Import.io provides a way for anyone with a web data need to extract information with a very user-friendly, intuitive, and interactive interface. The cloud-based scraping platform can structure data found behind images, login screen and hundreds of web pages with absolutely no coding. Monitoring website changes and the ability to integrate with a number of reporting tools and apps make it a great option for enterprises with a pressing scraping need. A simple and light-weight UI that works well for non-coders looking to build their list of prospects or track price changes. It’s a viable option for scraping at a reasonable speed efficiently from different websites concurrently. If this sounds like your Aha product then there should be just one thing stopping you from trying it - the PRICE! While they had adopted a freemium model earlier, it’s no longer available (basic plan begins at $299/month) and scraping more pages equals scraping more dollars off your pocket. Earlier called CloudScrape, Dexi.io is another visually stunning extraction automation tool positioned for commercial purposes and is available as a hassle-free browser app. Dexi has provisions for creating robots that can work as an extractor or crawler or perform ETL data cleansing tasks after extraction in the form of Dexi Pipes. 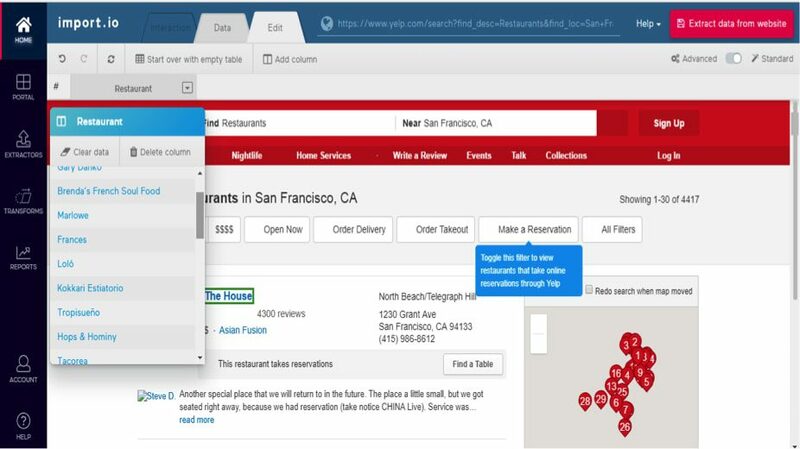 The powerful scraping tool gives suggestions after data selection on the webpage for intelligent extraction features that resolves pagination issues, performs extraction in a loop and takes screenshots of web pages. There are no tough set-up routines that you’ve got to follow. Sign up and the browser app opens for you to create your robot. Their awesome support team will help you with the bot creation in case you hit a roadblock. For a commercial tool, the standard plan priced at $119/month (for small projects) is very reasonable and the professional plan would be apt for a larger business needs. The concept of add-ons in Dexi.io though attractive at first becomes a handful to maintain as the add-ons increase and so does the cost for any add-on in the store. There are slight murmurs and grunts about the product documentation which I believe Dexi folks can easily fix. The blue Octo promises data at your fingertips with no programming at all and they’ve really got it. Within just 2 years of their launch, Octoparse has gone through 7 revised versions tweaking their scraping workflow with the feedback received from users. It’s got an intuitive point-and-click interface that supports infinite scrolling, log-in authentication, multi-format data export and supports unlimited pages per crawl in its free plan(yes, you heard that right!). Scheduled crawling features and provision for unlimited web pages per crawl make it an ideal choice for price monitoring scenarios. Features provided in their free plan are more than enough if you are looking for an effective one-time, off-the-shelf solution with good user guide documentation. Also, precise extraction of data can be achieved with their in-built XPath and Regex tools. Octoparse is yet to add pdf-data extraction and image extraction features (just image URL is fetched) so calling it a complete web data extraction tool would be a tall claim. Customer support is not great for the product and timely responses are not to be expected. ParseHub has a rich UI and pulls data from many tricky areas of a website, unlike other scrapers. Developers can play with ParseHub’s RestfulAPI for good data access after they are happy with the one-off scrape. The purported free plan from ParseHub looks painful by limiting number of scraped pages to 200 and just 5 projects in all. Plus, their paid versions begin at a whopping $149 per month which sounds way overboard especially for one-time scrapes. Speed at which scrape is performed needs to be vastly improved which also slows down the rate at which large volume scrape is done. Outwit technologies offers a simple, no-fancy GUI which was initially offered as a Firefox add-on (legacy version still available but with no feature updates) and now comes as a freely downloadable software that can be upgraded to Light and Pro version. 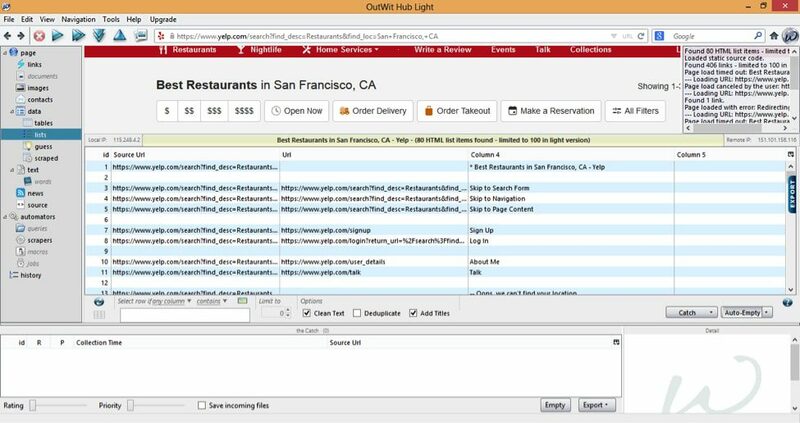 With no programming skills, Outwit Hub can extract and export links, email addresses, RSS news and data tables to CSV, HTML, Excel or SQL databases. Their other products like Outwit Images and documents fetch images and docs from websites to your local drives. It’s a flexible and powerful option for people looking to source contacts and is priced appropriately beginning at $69 for the basic one-time standalone application purchase. The “Fast Scrape” feature is a nice add to quickly scrape data from a list of URLs that you feed Outwit. Outwit’s aptness for repeated, high volume scrapes is questionable and their documentation and tutorials definitely need a lift. The product lacks a point-and-click interface so first time users may need to go through random Youtube tutorials before their scrape venture. A visual web scraping software with a macro designer component to develop a scraping project flowchart by looking at the website alongside the same screen. The Python-based tool can be run on both Windows and Mac OS machines with good Regex support. FMiner has advanced data extraction features like captcha solving, post-extraction data refining options and allows you to embed python code to run tasks on target websites. Being multi-platform and a software feasible for both the no-code as well as the developer community, FMiner is powerful for data harvesting from complex site layouts. After a 15-day trial, you are forced to purchase at least the basic software version which is priced at $168 with no scheduling, email reporting or JS support. Btw, how active are they in keeping their product updated? Not so sure as there’s no news on recent improvements in FMiner. Next, we examine Developer-Friendly Web scraping Tools.